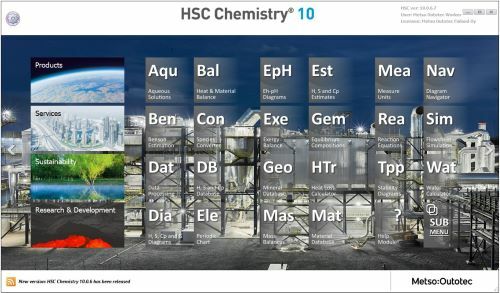 Outotec's chemical reaction and equilibrium software HSC Chemistry is the world's favorite thermochemical software with a versatile flowsheet simulation module. HSC is designed for various kinds of chemical reactions and equilibria calculations as well as process simulation. HSC software makes conventional thermodynamic calculations fast and easy to carry out with personal computers. Therefore HSC has a wide range of applications in scientific education, industry and research. Thermochemical calculations are useful, for example, when developing new chemical processes and improving old ones. HSC Chemistry is also a useful tool for universities and schools in chemical practicals and studies. Traditionally, thermodynamic calculations based on experimental or assessed data have utilized stability functions in various thermodynamic data books and papers in scientific journals. The difficult searching stage and complicated calculations, as well as inconsistencies arising from different selections of standard and reference states, made this calculation procedure quite time-consuming. HSC Chemistry offers powerful calculation methods for studying the effects of different variables on the chemical system at equilibrium. For example, if the user gives the raw materials, amounts and other conditions of almost any chemical process, the program will give the amounts of the product as a result. HSC also makes heat and material balance calculations of different processes much more easily than any manual method. The Eh-pH -diagrams option also offers a very fast way of studying the dissolution and corrosion behavior of different materials. Of course, HSC cannot solve all chemical problems, because it does not take into account the kinetics (rates) of chemical reactions and the non-ideality of solutions. However, in many cases it is a very inexpensive and useful tool which helps to find the optimal reaction conditions and yields for experimental investigations without expensive trial-and-error chemistry. The name of the program is based on the feature that calculation modules automatically utilize the same extensive thermochemical database, which contains enthalpy (H) , entropy (S) and heat capacity (C) data, for more than 28 000 chemical compounds. This database is equivalent to more than twenty thick data books. 11. Water - Steam tables, etc. We are happy to announce a new release of HSC 9. Season's greetings, HSC Chemistry 9.8 coming soon! Merry Christmas and happy holidays from the HSC Chemistry development team to all HSC users around the world!